“I can’t believe a guy could write a book this good and just disappear.” In 1972, Mark Moskowitz, a college freshman, picked up a copy of a novel called The Stones of Summer based on a New York Times review exuberantly stating it was the “definitive book” of his generation. However, he abandoned the book after about 20 pages and set it aside. Twenty-five years later, Moskowitz, now a filmmaker, rediscovered the book, which had fallen into obscurity. However, when Moskowitz did some research online to find out about the book’s author, Dow Mossman, he discovered absolutely nothing. Moskowitz’s quest to find out what happened to Mossman, a once-promising author who received his MFA from the Iowa Writers’ Workshop, and why he mysteriously vanished from the literary world serves as the basis of this intriguing documentary. In an interview, Moskowitz stated, “it’s like a guy’s been regaling you with great stories at the dinner table for five hours. Then he gets up and leaves, and you never see him again.” Along the way, the documentary also addresses the unpredictability of the publishing industry, as well as how discovering certain novels can really affect our lives. Moskowitz ends up interviewing anyone remotely related to The Stones of Summer (even going as far as chatting with the guy who designed the book jacket! ), as well as author Frank Conroy, critic Leslie Fiedler and others. But will he get the opportunity to interview Mossman and find it just what the hell happened to his literary career? You’ll just have to watch Stone Reader yourself to find out! 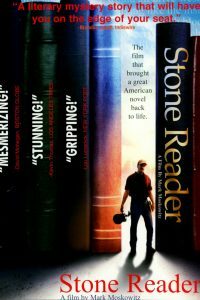 Inevitably, the film is simply about the love of reading and should be watched by any avid reader. As a side note, I purchased a copy of The Stones of Summerafter watching the documentary and abandoned the book after about 50 pages – couldn’t get into it at all! I do recommend Conroy’s uniquely original 1967 memoir, Stop-Time, one of my own personal favorites, which contains such great lines as “The days were emptiness, a vast, spacious emptiness in which the fact of being alive became almost meaningless.” Stone Reader won both the Special Grand Jury Honor and Audience Award for Best Feature Film at the 2002 Slamdance Film Festival.